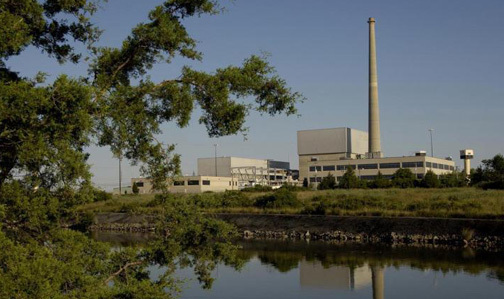 The federal Nuclear Regulatory Commission this week upheld an enforcement action known as a “yellow” finding against the Oyster Creek nuclear generating station in Lacey Township following the investigation of release valves at the plant in 2014. The “yellow” finding is the NRC’s second-highest enforcement action, and indicates “substantial safety significance,” NRC officials said in a statement released Monday. The plant was also given a “white” finding for a separate incident involving the plant’s emergency generators and a broken cooling fan. The “yellow” finding involves design aspects of electromatic relief valves, or EMRVs, for the plant, which is owned by Exelon Corporation and scheduled to shut down in 2019. According to the NRC, during refurbishment work in June 2014 on two EMRVs removed from the plant in 2012, the company found an alignment problem with the valve’s actuator. When the valves were tested, they did not open. Once the issue was identified, Exelon immediately tested five of its then-installed EMRVs, officials said. All five actuated successfully. The company ultimately installed redesigned actuators for the valves during a refueling and maintenance outage at the plant in October 2014. Even though the violation involving the EMRVs has been classified as “yellow,” the NRC has determined it represents an old design issue. “That is, the issue stems from an inspection finding involving a past design-related problem and does not reflect a current performance deficiency associated with existing programs, policies or procedures used by the company,” the agency’s statement said. As a result of the finding, the NRC will carry out a team inspection that will review Exelon’s root- cause evaluation and corrective actions for the issue. On the issue involving one of the plant’s emergency diesel generators that yielded a “white,” or less severe, finding, a back-up power source may not have been available to operate because of the degradation of its cooling fan drive shaft. 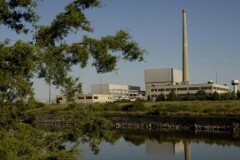 Oyster Creek, like other nuclear power plants, transmits power to the grid but also receives power from the grid for the operation of safety systems. When that off-site power is unavailable, the plant’s emergency diesel generators activate to provide power to key safety systems. On July 28, 2014, during a bi-weekly test of one of the plant’s emergency diesel generators, alarms involving the generator were received. Plant personnel discovered the belt-driven cooling fan drive shaft had sheared into two pieces, resulting in the generator becoming inoperable. The fan keeps the generator from overheating when operating, the NRC said. According to the NRC, workers replaced the fan shaft and performed a failure analysis on the damaged shaft. It was determined that fatigue was the cause of the shaft’s failure. NRC inspectors learned that in May 2005, Exelon changed the method for tensioning the generator’s cooling fan belt but did not adequately verify the acceptance criteria for the change, the statement said. The company did not detect that the change left the shaft subject to fatigue and, as a result, the failure occurred on July 28, 2014. Further, the period of inoperability for the generator exceeded its allowable outage time in violation of the plant’s technical specifications. Unlike the EMRV design issue, the tensioning issue was identified by the NRC. For both issues, the NRC offered Exelon an opportunity to take part in a regulatory conference, to provide additional information in writing or to accept the findings as characterized. The company provided written responses on March 13 for each issue; it disagreed with “some aspects” of the NRC’s analysis of the EMRV issue, the statement said, concluding that the issue was less significant than characterized by the agency. The NRC considered the points raised by Exelon and concluded that the EMRV issue was appropriately characterized as “yellow.” For the EDG “white” finding, the company accepted the finding and its significance determination. The NRC will perform team inspections in response to both inspection findings once Exelon notifies the agency of its readiness for the reviews.